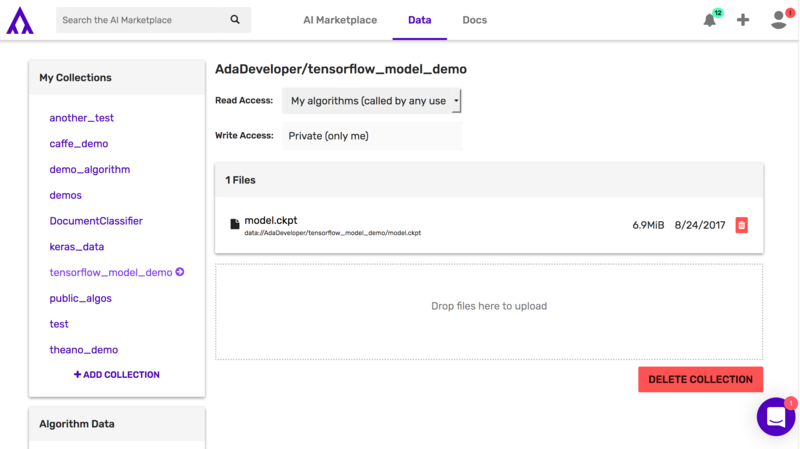 Welcome to deploying your pre-trained Tensorflow model on Algorithmia! Currently we support tensorflow-gpu up to version 1.3.0, future versions such as the latest 1.7.0 will not function properly due to gpu limitations. For tensorflow-gpu 1.3.0 support please add one of the following wheels to your dependencies file in replacement of tensorflow-gpu==1.3.0: python2 / python3. We apologize for the inconvenience. If you run into any issues please let us know. After training your Tensorflow model, you’ll need to save it, along with its assets and variables. There are a few ways to save models in different versions of Tensorflow, but below, we’ll use the SavedModel method that works with multiple versions - from Tensorflow 1.2 to the current version. Because of how Tensorflow doesn’t save the entire graph architecture when using saver.save & saver.restore (which require the same Tensorflow global context to be used), you’ll need to use tf.saved_model.Builder to save your TF model. Read data from mnist dataset. Every data point has two parts: image (xs) and label (ys). In the above code, the Manual Builder API is used to save your graph using a MetaGraph. That way all of the graph and its variables, assets, and signatures will be saved as a protocol buffer. Note that the signature is the set of inputs and outputs from your graph. 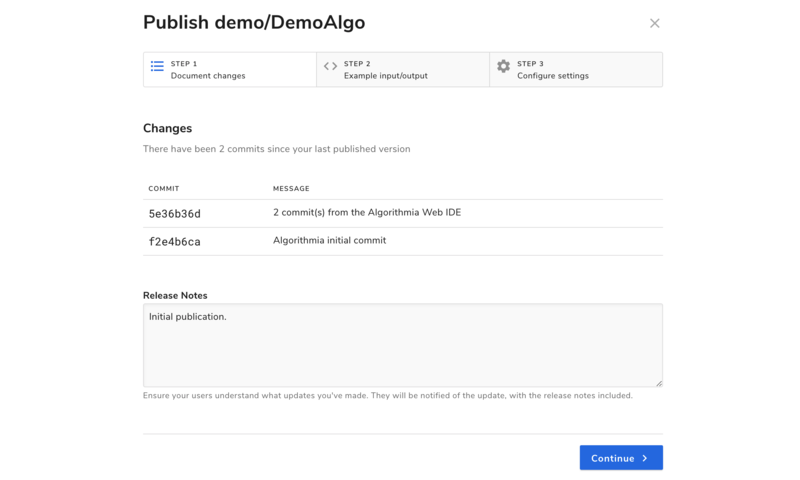 Now that you’ve trained and saved your Tensorflow model elsewhere, we’ll deploy it on Algorithmia. First, you’ll want to create a data collection to host your graph and variables. Next, upload your Tensorflow variables and graph to your newly created data collection. They should be in a .zip file or .gzip, although note our examples show using zip format so you’ll need to change the code in your main model file in the function extract_model() to extract your gzip accordingly or simply save your model as a .zip file. If you plan on using tensorflow with GPU support, make sure to use the tensorflow-gpu python package instead of the tensorflow one, with the version number 1.2.0 as shown in the dependency file in the above screenshot. If you are creating an algorithm that is utilizing CPU’s instead, then go ahead and either add the Tensorflow version like this tensorflow==1.7.0 or simply tensorflow to your dependency file to get the latest version. 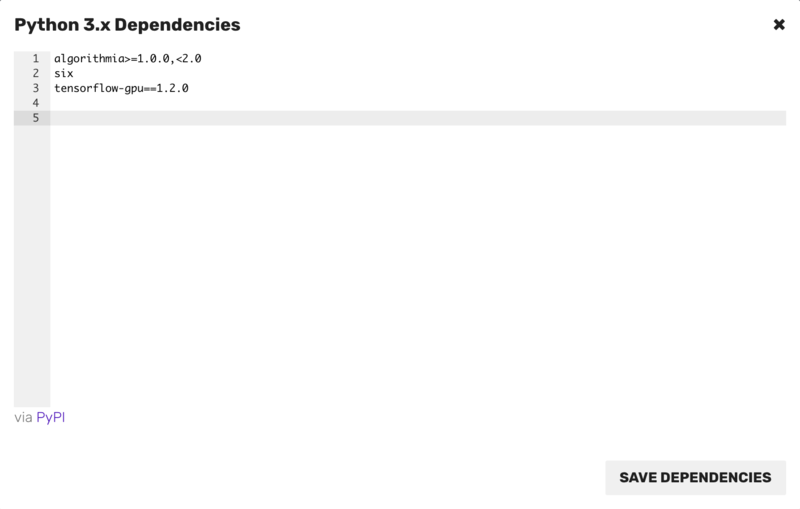 Now that you’ve seen how to save your model using SavedModelBuilder, you can load your model using the Algorithmia IDE. The following code sample is adapted from MNIST for Beginners tutorial from Tensorflow. If you want to follow along, you can add the MNIST data files to your data collection, but make sure you update the username and path to match your own. # Read number of entries. # Set your memory fraction equal to a value less than 1, 0.6 is a good starting point. # If no fraction is defined, the tensorflow algorithm may run into gpu out of memory problems. Let’s take a look at another example that we’ve implemented ourselves, the tensor names entirely depend on your graph, so replace our variables and types with yours as necessary. As you can see, most of the processing is similar, but we use a different endpoint to actually create the graph. Are you running into out of memory exceptions? Tensorflow attempts to allocate all available gpu memory. By defining a configuration with a max memory fraction you can ensure algorithm stability. Also, uncomment allow_growth if you aren’t sure how much memory your algorithm needs, tensorflow will grow it’s gpu memory allocation as necessary. If you want to have a better idea of what a finished tensorflow algorithm looks like, check out: InceptionNet or one of the demos for Tensorflow MNIST CPU and Tensorflow MNIST GPU already mentioned in this guide. That’s it for hosting your tensorflow model on Algorithmia!